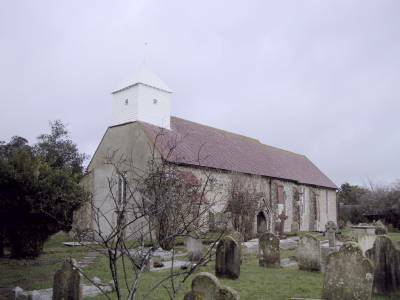 This lovely little 12th century church lies south of Fontwell on the A27 road between Chichester and Arundel. It adjoins a farm yard at the end of a lane running south from the village. Entering via the flint brick lined porch dating from the thirteenth century and one is struck by a sense of great peace and serenity pervading inside. Small round Norman windows high in the nave walls let in a good light. The church has no separate chancel. The eye is immediately drawn to the fine east window. The three lancet windows have been filled with stained glass showing scenes from the life of the Virgin Mary designed by Joan Fulleylove who died in 1947. The left hand window shows the marriage of Mary and Joseph, Mary going to the Temple, Ann and Joachim at the Golden Gate and Joachim's Gift rejected. The central window depicts Mary and the child Jesus and the Annunciation, whilst the right hand window shows the Crucifixion, the Flight into Egypt, the Adoration of the Magi and the Visitation. Plain glass windows on the south side give marvellous light into the chancel. Their infant son Isaac who died aged 14 months in 1771 is described as 'This little Lamb that was so small'. On the north wall of the nave hangs a beautifully illuminated scroll listing all the vicars since 1333 as well as a memorial to Ebenezer James Marshall 1832-99 Headmaster of Brighton Grammar School for nearly 40 years which states 'to this Church are turned the thoughts of his Old Boys all over the world as they recall many hallowed reunions within these walls.' An odd place for an Old Boy's Reunion? On the south wall are War Memorials to the men of the parish including one to Peter Baker killed at Cape Helles, Gallipoli on December 7, 1915. Hanging on the wall of the chancel is a photograph of the 600 year old bell, rehung in 1972 with its inscription 'Ave Maria Gracia Plena'. 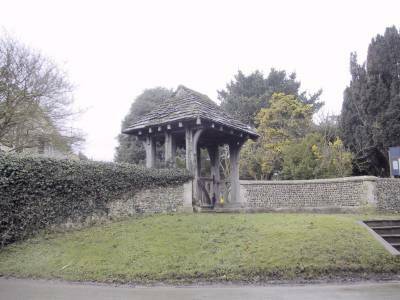 The bell cast by John Rutland in 1348 and weighing 3 cwt is one of the oldest in the county. In the passage leading to the vestry graffiti can be seen which in translation reads 'Pray for the soul of my father who died at Agincourt', an unexpected reference to the famous battle of 1415 in the Hundred Years War. On the window sill in the north wall is a 15th century wooden statue of St Elizabeth of Hungary holding a loaf of bread in her hands. It is of Flemish or German origin and was presented by a former vicar. Much more modern are several small Stations of the Cross embroidered by Ann Balaam in 1986. The ceilings are plastered and most of the furnishings are modern including the organ which stands in the old north chapel. Here a chantry altar endowed by John le Taverner of Chichester a local landowner was once situated. Various scratches and mason's marks can be seen on the adjoining walls. The peaceful setting of this simple country church adds to its attraction with the pretty white weather-boarded bell-cote catching the eye as soon as one walks through the lych gate.